It was steaming hot in my neighborhood last weekend. It is summer, after all, and the dog days seem to have arrived. It just so happened that while bopping around the Internet, a picture of a mint Gin Rickey, a cocktail I had neither heard of nor tasted, caught my eye as a perfect summer cocktail. I'm telling you, this cocktail looked very appealing to me on a summer day when I was mopping my brow every few minutes or so. The mint Gin Rickey looked so much like a mojito, one of my other favorite summer cocktails, I was surprised I had never heard of it, nor seen it on a drink menu before. I was excited, though! 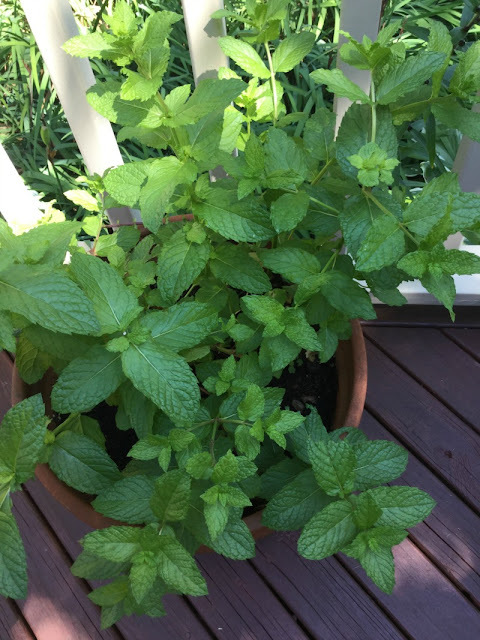 This was an opportunity to try something new and use some of the beautiful mint leaves I have growing on my deck. The ingredients in a Gin Rickey are simple. This cocktail is just a mixture of fresh lime, gin, and seltzer or club soda. 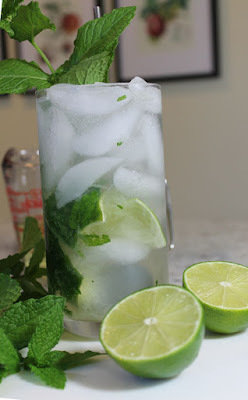 For my mint Gin Rickey, I added a mint infused simple syrup and muddled mint leaves. Serve it in a tall glass filled with lots of ice for a refreshing cocktail that will help you beat the heat this summer. You'll want to serve this cocktail in a tall cooler glass. 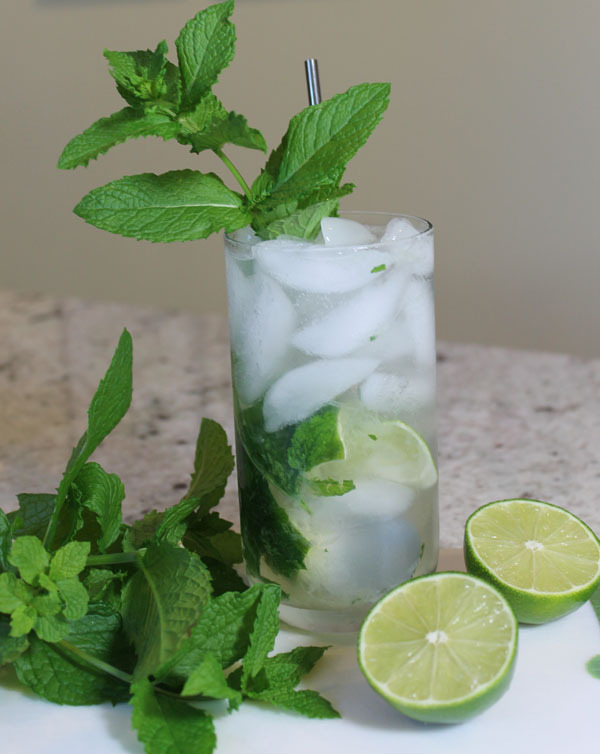 I also love to use my stainless steel drink straws with tall cocktails like the mint Gin Rickey. They are so easy to keep clean in the dishwasher. I've had mine for several years and use them often. You'll also want a muddler to make this drink. If you don't have one yet, you should get one. A muddler is essential for cocktails made with herbs or fruit. I use a wooden muddler. Like most drink recipes, feel free to tweak this one to your liking. The recipe you see below is how I like this drink. Hubby prefers to make it with only 1/2 ounce of the mint simple syrup. The juiciness of your lime may influence the amount of simple syrup you need. Make it the way you like it. Make the simple syrup by mixing one cup granulated sugar with one cup of water in a small pan over medium heat. Add a handful of fresh mint leaves and stir until the sugar is completely dissolved. Remove the pan from the heat to cool. Strain the mixture and set aside. To make the cocktail: Use a tall glass. 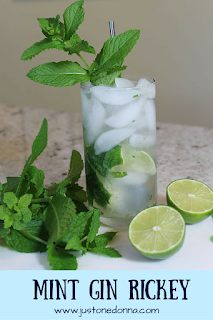 Place the cut up lime and mint leaves in the bottom of the glass and muddle to release the lime juice and the oils from the rind and the mint leaves. Fill the glass with ice. Pour in the gin and fill the glass with seltzer. Stir the drink with a spoon or one of the stainless steel straws to be sure the flavors are well combined. 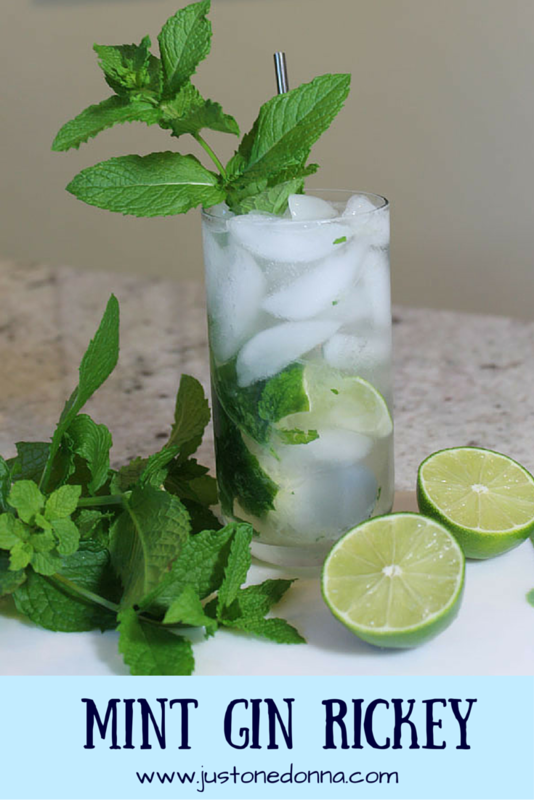 Garnish with mint leaves and enjoy. A hot summer evening is the perfect time to enjoy a mint Gin Rickey. It is an old-fashioned cocktail that will make you feel cool.